For other uses, see See You Again (disambiguation). "How Bad Do You Want It (Oh Yeah)"
"See You Again" is a song recorded by American rapper Wiz Khalifa, featuring American singer Charlie Puth. The track was commissioned for the soundtrack of the 2015 action film Furious 7 as a tribute to actor Paul Walker, who died in a single-vehicle accident on November 30, 2013 in Valencia, California. Later on, the song was included as a bonus track on the international release of Puth's debut album, Nine Track Mind. The artists co-wrote the song with its co-producers, DJ Frank E and Andrew Cedar, with additional production from Puth and mixing provided by Manny Marroquin. "See You Again" was released on March 10, 2015, as the soundtrack's lead single in the United States. "See You Again" became both Khalifa's and Puth's biggest single to date. It spent 12 non-consecutive weeks atop the US Billboard Hot 100, tying Eminem's "Lose Yourself" for the longest-running rap number-one single in the country, and topped the UK Singles Chart for two consecutive weeks. It also reached number one in several other countries including Australia, Austria, Canada, Germany, Ireland, New Zealand and Switzerland. The song held the record for the most-streamed track in a single day on Spotify in the United States, until it was surpassed by "Drag Me Down". It set the record for most streams in a single week worldwide, and in the United Kingdom also in a single week. The music video was the most viewed video on YouTube from July 10 to August 4, 2017. "See You Again" received three nominations at the 58th Annual Grammy Awards: Song of the Year, Best Pop Duo/Group Performance and Best Song Written for Visual Media. It was also shortlisted for the Song of the Year for the BBC Music Awards and was nominated for Best Original Song at the 73rd Golden Globe Awards. "See You Again" was the best selling-song of 2015 worldwide, with combined sales and track-equivalent streams of 20.9 million units according to IFPI. "See You Again" was written by DJ Frank E, Charlie Puth, Wiz Khalifa, and Andrew Cedar. It was produced by DJ Frank E, Charlie Puth, and Andrew Cedar. Frank E and Puth were approached by their publishing company, Artist Publishing Group, to develop a melody that could pay tribute to the late Paul Walker for the film Furious 7 (2015). His publishing company's president Ben Maddahi then set up a first-time studio session for Puth with DJ Frank E at a studio in Los Angeles. Puth became emotionally attached while writing the track, recalling Vail Cerullo, a friend of Puth's time at Berklee College of Music, who perished in a motorcycle accident in 2012. He was at first reluctant that the film's soundtrack label, Atlantic Records, would choose his vocal for the song. In an interview with the Los Angeles Times, Puth recalled, "It just seemed to occur from out of nowhere. And basically 10 minutes later Justin and I wrote it, we sent it off, and I thought we'd never hear about it again." Puth and DJ Frank E's output from the session was well received by Furious 7 filmmakers, Universal Pictures, and Atlantic. As a result, the track was further commissioned to include rapped verses by Khalifa based on the subject of family, combined with Puth's vocals and a piano melody. The song then went through an extensive note-giving and production process. Puth opined that his vocal was chosen by Atlantic because of his emotional attachment to the subject matter. Puth revealed on The Talk that Universal originally wanted to get a more established singer to sing his part. He also revealed in one of his interviews that the song's hook was originally written for Sam Smith. The song was chosen to be played at the end of the film. Following O'Conner's retirement send-off to be with his wife and family, the characters Brian O'Conner and Dominic Toretto drove on a mountain road and parted ways upon reaching a fork. 4 and has a tempo of 80 beats per minute (Andante/Andantino). In the United States, "See You Again" debuted on the Billboard Hot 100 and Hot R&B/Hip-Hop Songs charts dated March 19, 2015, at number 100 and number 29 respectively, with first-week sales of 25,000 copies. On the chart issued for April 18, 2015, the song climbed from number 84 to number ten on the Billboard Hot 100, selling 168,000 copies as the chart's "Digital Gainer" that week. Its climb into the top ten was the chart's biggest since Katy Perry's "Roar" (2013). In its fifth week, "See You Again" sold 464,000 copies and rose from number ten to number one on the Billboard Hot 100. The song marked Khalifa's second number one on the chart, following "Black and Yellow" (2011), and Puth's first. It topped the Billboard Hot 100 chart for twelve non-consecutive weeks. After its twelfth week it was finally knocked off the top spot by OMI's hit, "Cheerleader". It is one of 33 songs to reach number one for at least 10 weeks on the Billboard Hot 100. The song also topped the Mainstream Top 40 and Rhythmic charts for four weeks and three weeks respectively. The song also topped Hot Rap Songs and Hot R&B Hip Hip songs for 14 weeks each. As of July 7, 2016, "See You Again" has sold a total of 4,122,938 copies in the United States. The song fell out of the top ten on the chart dated August 29, 2015, spending a total of 19 weeks in the top ten. The song holds the record for the most-streamed track in a single day on Spotify in the United States. It set the record for most streams in a single week worldwide during April 6 to April 12 (streamed 21.9 million times), and in the United Kingdom in a single week (streamed 3.72 million times from April 20 to April 26, 2015), which was broken by Justin Bieber's "What Do You Mean?" (streamed 3.87 million times from September 17 to September 23, 2015). "See You Again" debuted at number 20 on the UK Singles Chart issued for April 12, 2015 on streaming alone. It registered 1.8 million streams in the United Kingdom that week. Following its digital release, the song climbed to number one on the chart dated April 19, 2015. It sold 193,000 units that week, becoming the fastest-selling single in the United Kingdom of 2015. The song also broke the streaming record in the United Kingdom that week with a total of 3.68 million streams that week. It marked Khalifa's second number one on the chart—following his feature on Maroon 5's "Payphone" (2012)—and Puth's first. "See You Again" sold 142,000 units during its first week at number one, and broke its own streaming record with 3.72 million streams that week. Omi's "Cheerleader" replaced "See You Again" at number one the following week, selling approximately 1,000 units more than "See You Again" at number two. In New Zealand, "See You Again" debuted at number 34 on the New Zealand Singles Chart dated March 30, 2015. It topped the chart in its third week, becoming Khalifa and Puth's first number one single in the country. 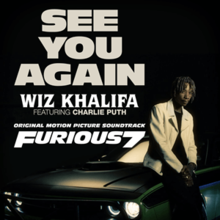 In Australia, "See You Again" rose from number 59 to number one on the Australian Singles Chart issued for April 11, 2015, marking Khalifa and Puth's first number one hit on the chart. The song's climb to number one was the largest in Australian Singles Chart history. The music video for "See You Again" was directed by Marc Klasfeld. It was uploaded to YouTube on April 6, 2015. The "See You Again" music video was the most viewed video on YouTube from July 10 to August 4, 2017 and the most liked video on the site from August 28, 2016 to July 25, 2017. As of April 17, 2019, it has received over 4 billion views and 23.6 million likes, making it the site's third most viewed and second most liked video. It is one of 159 videos to exceed one billion views, 33 videos to exceed two billion views, seven videos to exceed three billion views and three videos to exceed four billion views. It was the second video ever to record two billion and three billion views, and the third video ever to reach four billion views. The video begins with a shot of a cliff top at sunset, followed by Khalifa walking down a highway road. Puth is then shown singing the chorus whilst sitting at, and playing, a piano located between two cars. Khalifa's rap verses and Puth singing the second chorus and bridge are interspersed with footage from Furious 7. After the bridge, we see the final scene from the film: Dominic Toretto (Vin Diesel) and Brian O'Conner (Cody Walker, filling in for his brother, Paul), driving together, pull over in their cars and smile at each other one last time before driving away on separate roads into the sunset. After the camera pans up into the sky, the screen turns white, the words "For Paul" appear on screen and the video ends. The video was the most viewed video on YouTube from July 10, 2017, when it surpassed "Gangnam Style" by Psy, to August 4 of that year, when it was surpassed by "Despacito" by Luis Fonsi featuring Daddy Yankee. It reached 2 billion views on September 3, 2016, doing so in 515 days. It reached 3 billion views on August 6, 2017 and is the third fastest video to accomplish the feat, doing so in 853 days. It reached 4 billion views on February 7, 2019. As of April 17, 2019, the video has received over 4 billion views on YouTube making it the third most viewed video on the website. It has received over 23.6 million likes and over 775,000 dislikes as of April 17, 2019. The video is the second to reach 10 million and 20 million likes. The video was nominated for Best Hip-Hop Video and Best Collaboration at the 2015 MTV Video Music Awards, but lost both. On August 27, 2016, the music video surpassed "Gangnam Style" as YouTube's most liked video of all time, after "Gangnam Style" held the record for almost 4 years. Also, on February 19, 2017, the music video succeeded "Gangnam Style" as the most rated YouTube video of all time with over 13.8 million total ratings. It has since been surpassed by "Despacito" as the most viewed, liked and rated video on YouTube. Khalifa and Puth performed "See You Again" live on The Tonight Show Starring Jimmy Fallon in March 2015 and on an episode of Saturday Night Live in May 2015. Diesel also performed the song live as a tribute to Walker during the 2015 MTV Movie Awards. Khalifa and Puth reprised the song in a performance on The Ellen DeGeneres Show in April 2015. Khalifa has performed the song, without Puth, as part of the Boys of Zummer Tour, in which Khalifa co-headlined with Fall Out Boy. Puth performed the song at the Capital Jingle Bell Ball in 2015. Khalifa also performed the song on season 8 of The Voice, with season 7 finalist Chris Jamison performing Puth's vocals. Wiz Khalifa also performed the song at the Mnet Asian Music Awards 2016. The intentions were for the song to be performed as a collaboration between Wiz Khalifa and Taeyeon, member of girl group Girls' Generation but the stage was later cancelled for reasons unknown. Khalifa & Puth also performed the song at the 2016 Kids' Choice Awards. ^ "Wiz Khalifa's 'See You Again' Leads Hot 100 for 10th Week". Retrieved June 30, 2015. ^ "Ed Sheeran Blasts to New Spotify Record for One-Day Streams". Billboard. Retrieved November 29, 2017. ^ "Furious 7: Original Motion Picture Soundtrack". Qobuz. Retrieved June 11, 2015. ^ a b Highfill, Samantha (April 7, 2015). "Charlie Puth talks writing 'See You Again' for Paul Walker's goodbye". Entertainment Weekly. Retrieved April 11, 2015. ^ "The Hill School -> Vail Cerullo '09 Remembered in Number 1 Billboard Hit & Fast and Furious Theme Song". www.thehill.org. ^ "Local Man Inspires Hit "Furious 7" Song". nbcphiladelphia.com. May 12, 2015. ^ a b c Zeitchik, Steven (April 7, 2015). "'Furious 7': 'See You Again' songwriter inspired by a different loss". Los Angeles Times. Retrieved April 9, 2015. ^ "Charlie Puth: See You Again was meant for Sam Smith". January 28, 2016. Retrieved July 7, 2018. ^ "Finally, the No. 1 Pop Song in the Country Is the Best Pop Song in the Country". Spin. Retrieved September 22, 2015. ^ "Wiz Khalifa's 'See You Again' Has Become an AC Hit… Without Wiz Khalifa". Billboard. Retrieved January 14, 2016. ^ "Wiz Khalifa "See You Again" Sheet Music in Bb Major". musicnottes.com. ^ Trust, Gary (April 17, 2015). "Started From the Bottom: Wiz Khalifa's 'See You Again' & Other No. 1s That Debuted at No. 100". Billboard. Retrieved April 17, 2015. ^ Mendizabal, Amaya (March 20, 2015). "'Empire' Is First TV Series Soundtrack to Top R&B/Hip-Hop Albums Chart". Billboard. Retrieved April 5, 2015. ^ Caulfield, Keith (April 8, 2015). "'Uptown Funk' ties for second-longest No. 1 in Billboard history". Billboard. Retrieved April 8, 2015. ^ Trust, Gary (April 15, 2015). "Wiz Khalifa's 'See You Again' Knocks 'Uptown Funk' Off No. 1 on Hot 100". Billboard. Retrieved April 16, 2015. ^ Trust, Gary (May 28, 2015). "Taylor Swift's 'Bad Blood' Blasts to No. 1 on Hot 100". Billboard. Retrieved May 28, 2015. ^ a b Trust, Gary (June 3, 2015). "Wiz Khalifa's 'See You Again' Replaces Taylor Swift at No. 1 on Hot 100". Billboard. Retrieved June 4, 2015. ^ "Wiz Khalifa's 'See You Again' Leads Hot 100 for 10th Week". Billboard. ^ Trust, Gary (June 2, 2015). "Chart Highlights: Taylor Swift Ties Record as 'Bad Blood' Hits Pop Songs Top". Billboard. Retrieved June 3, 2015. ^ Trust, Gary (June 9, 2015). "Chart Highlights: Shawn Mendes Sews Up First Pop Songs Airplay Hit With 'Stitches'". Billboard. Retrieved June 9, 2015. ^ Mansell, Henry (August 22, 2015). "Hip Hop Single Sales: The Weeknd, Fetty Wap & Silentó". HipHopDX. Cheri Media Group. Retrieved August 22, 2015. ^ a b c Mokoena, Tshepo (April 16, 2015). "Wiz Khalifa breaks record for most Spotify streams in 24 hours". The Guardian. Retrieved April 16, 2015. ^ Staff, THR (April 15, 2015). "Wiz Khalifa's 'Furious 7' Single Gets 4.2 Million Spotify Plays in One Day, Most Ever". The Hollywood Reporter. Retrieved April 16, 2015. ^ a b Moss, Liv (April 26, 2015). "Wiz Khalifa claims second week at Number 1, breaks streaming record". Official Charts Company. Retrieved April 27, 2015. ^ Myers, Justin (April 12, 2015). "Jess Glynne holds off Nick Jonas to claim third week at Number 1". Official Charts Company. Retrieved May 11, 2015. ^ Copsey, Rob (April 19, 2015). "Wiz Khalifa claims fastest-selling single of 2015". Official Charts Company. Retrieved April 19, 2015. ^ Copsey, Rob (May 3, 2015). "OMI's Cheerleader makes last minute grab for number one". Official Charts Company. Retrieved June 10, 2015. ^ "NZ Top 40 Singles Chart – 30 March 2015". Official New Zealand Music Chart. Retrieved April 14, 2015. ^ "NZ Top 40 Singles Chart – 13 April 2015". Official New Zealand Music Chart. Retrieved April 14, 2015. ^ Ryan, Gavin (April 11, 2015). "ARIA Singles: Wiz Khalifa See You Again Is No 1". Noise11.com. Retrieved April 11, 2015. ^ Andres Tardo (April 15, 2015). "Wiz Khalifa Opens Up About Writing Emotional Paul Walker Tribute 'See You Again'". MTV. Retrieved April 16, 2015. ^ Dresdale, Andrea. "'See You Again' Breaks Record for Most-Viewed YouTube Video of All Time". ABC News. Archived from the original on July 12, 2017. Retrieved July 30, 2017. ^ a b McIntyre, Hugh. "'Despacito' Has Just Become the Most Popular Video of All Time on YouTube". Forbes. Retrieved August 4, 2017. ^ a b "All Time Most Viewed YouTube Videos". dbase.tube. Retrieved April 20, 2019. ^ "All Time Most Liked YouTube Videos". dbase.tube. Retrieved April 20, 2019. ^ "All Time Most Viewed YouTube Videos". dbase.tube. Retrieved April 1, 2019. ^ Lawrence, Derek (September 7, 2016). "Wiz Khalifa and Charlie Puth's 'See You Again' Video Hits 2 Billion YouTube Views". EW.com. Retrieved May 22, 2017. ^ Stutz, Colin (July 21, 2015). "2015 MTV Video Music Awards Nominees Revealed: Taylor Swift, Kendrick Lamar, Ed Sheeran & More". Billboard. Retrieved July 21, 2015. ^ Christ, Shawn (March 17, 2015). "Wiz Khalifa Performs 'Furious 7' Song 'See You Again' on 'The Tonight Show,' Fumbles Taylor Swift Catchphrase Question". Music Times. Retrieved April 5, 2015. ^ Bell, Amanda (April 12, 2015). "Vin Diesel Sings 'See You Again' For Paul Walker And We Have So Many Emotions". MTV News. Retrieved April 18, 2015. ^ Fleischer, Adam (April 16, 2015). "Wiz Khalifa's 'See You Again' Performance On 'Ellen' Is As Touching As The Video". MTV News. Retrieved April 25, 2015. ^ "Wiz Khalifa Comments On The Absence Of His Collaboration Stage With Taeyeon At The 2016 MAMA". December 3, 2016. Retrieved December 3, 2016. ^ "2015 Honorees". Hollywood Film Awards. Retrieved October 29, 2016. ^ "Absent Adele dominates BBC Music Awards". BBC. December 10, 2015. ^ "Furious 7". Soundtrack.Net. Retrieved March 28, 2016. ^ "See You Again – Wiz Khalifa". AllMusic. Retrieved June 11, 2015. ^ "Australian-charts.com – Wiz Khalifa feat. Charlie Puth – See You Again". ARIA Top 50 Singles. Retrieved April 20, 2015. ^ "Austriancharts.at – Wiz Khalifa feat. Charlie Puth – See You Again" (in German). Ö3 Austria Top 40. Retrieved April 5, 2015. ^ "Ultratop.be – Wiz Khalifa feat. Charlie Puth – See You Again" (in Dutch). Ultratop 50. Retrieved April 11, 2015. ^ "Ultratop.be – Wiz Khalifa feat. Charlie Puth – See You Again" (in French). Ultratop 50. Retrieved April 11, 2015. ^ "Hot 100 Billboard Brasil — weekly". Billboard Brasil. July 6, 2015. Archived from the original on January 6, 2015. Retrieved July 7, 2015. ^ "Wiz Khalifa Chart History (Canadian Hot 100)". Billboard. Retrieved April 8, 2015. ^ "Wiz Khalifa Chart History (Canada CHR/Top 40)". Billboard. Retrieved June 6, 2015. ^ "Wiz Khalifa Chart History (Canada Hot AC)". Billboard. Retrieved June 13, 2015. ^ "Anglo" (in Spanish). National-Report. April 27, 2015. Archived from the original on June 5, 2015. ^ "ČNS IFPI" (in Czech). Hitparáda – Radio Top 100 Oficiální. IFPI Czech Republic. Note: Change the chart to CZ – RADIO – TOP 100 and insert 201525 into search. Retrieved May 8, 2015. ^ "ČNS IFPI" (in Czech). Hitparáda – Digital Top 100 Oficiální. IFPI Czech Republic. Note: Change the chart to CZ – SINGLES DIGITAL – TOP 100 and insert 201517 into search. Retrieved May 8, 2015. ^ "Danishcharts.com – Wiz Khalifa feat. Charlie Puth – See You Again". Tracklisten. Retrieved April 17, 2015. ^ "Euro Digital Songs". Billboard. May 16, 2015. Retrieved January 14, 2016. ^ "Wiz Khalifa: See You Again (Feat. Charlie Puth)" (in Finnish). Musiikkituottajat – IFPI Finland. Retrieved April 21, 2015. ^ "Lescharts.com – Wiz Khalifa feat. Charlie Puth – See You Again" (in French). Les classement single. Retrieved April 11, 2015. ^ "Musicline.de – Wiz Khalifa feat. Charlie Puth Single-Chartverfolgung" (in German). Media Control Charts. PhonoNet GmbH. Retrieved April 5, 2015. ^ "Greece Digital Songs – May 16, 2015". Billboard. Retrieved April 25, 2015. ^ "Archívum – Slágerlisták – MAHASZ" (in Hungarian). Rádiós Top 40 játszási lista. Magyar Hanglemezkiadók Szövetsége. Retrieved June 11, 2015. ^ "Archívum – Slágerlisták – MAHASZ" (in Hungarian). Single (track) Top 40 lista. Magyar Hanglemezkiadók Szövetsége. Retrieved June 11, 2015. ^ "Chart Track: Week 16, 2015". Irish Singles Chart. Retrieved June 11, 2015. ^ "Wiz Khalifa feat. Charlie Puth – See You Again Media Forest". Israeli Airplay Chart. Media Forest. Retrieved June 11, 2015. ^ "Italiancharts.com – Wiz Khalifa feat. Charlie Puth – See You Again". Top Digital Download. Retrieved April 16, 2015. ^ "Wiz Khalifa Chart History (Japan Hot 100)". Billboard. Retrieved May 2, 2015. ^ "Charlie Puth Lebanese Chart Top 20 History". The Official Lebanese Top 20. May 24, 2015. Retrieved April 27, 2017. ^ "Wiz Khalifa – Chart history" Billboard Luxembourg Digital Songs for Wiz Khalifa. Retrieved April 21, 2015. ^ "Top 20 México Inglés. Semana del 11 al 17 de Mayo, 2015" (in Spanish). Monitor Latino. Retrieved May 27, 2015. ^ "Mexico Ingles Airplay". Billboard. Retrieved June 11, 2015. ^ "Nederlandse Top 40 – Wiz Khalifa" (in Dutch). Dutch Top 40. Retrieved April 18, 2015. ^ "Dutchcharts.nl – Wiz Khalifa feat. Charlie Puth – See You Again" (in Dutch). Single Top 100. Retrieved April 18, 2015. ^ "Charts.nz – Wiz Khalifa feat. Charlie Puth – See You Again". Top 40 Singles. Retrieved April 10, 2015. ^ "Norwegiancharts.com – Wiz Khalifa feat. Charlie Puth – See You Again". VG-lista. Retrieved April 13, 2015. ^ "Listy bestsellerów, wyróżnienia :: Związek Producentów Audio-Video". Polish Airplay Top 100. Retrieved June 8, 2015. ^ "Wiz Khalifa – Chart history" Billboard Portugal Digital Songs for Wiz Khalifa. Retrieved April 21, 2015. ^ "Airplay 100 – Cristi Nitzu | Kiss FM – 5 July 2015". Kiss FM. Archived from the original on January 27, 2018. Retrieved January 27, 2018. Note: User may scroll down the 'Podcasturi' menu to play or download the respective podcast. ^ "Wiz Khalifa feat. Charlie Puth – See You Again" (in Russian). Tophit. Retrieved June 5, 2016. ^ "Official Scottish Singles Sales Chart Top 100". Official Charts Company. Retrieved 19 April 2015. ^ "ČNS IFPI" (in Slovak). Hitparáda – Radio Top 100 Oficiálna. IFPI Czech Republic. Note: insert 201526 into search. Retrieved May 8, 2015. ^ "ČNS IFPI" (in Slovak). Hitparáda – Singles Digital Top 100 Oficiálna. IFPI Czech Republic. Note: Select SINGLES DIGITAL - TOP 100 and insert 201518 into search. Retrieved 8 May 2015. ^ "EMA Top 10 Airplay: Week Ending 2015-05-26". Entertainment Monitoring Africa. Retrieved September 17, 2015. ^ "South Korean Singles Chart: Week 18, 2015" (in Korean). Gaon Digital Chart. Retrieved May 4, 2015. ^ "Spanishcharts.com – Wiz Khalifa feat. Charlie Puth – See You Again" Canciones Top 50. Retrieved May 18, 2015. ^ "Swedishcharts.com – Wiz Khalifa feat. Charlie Puth – See You Again". Singles Top 100. Retrieved April 16, 2015. ^ "Swisscharts.com – Wiz Khalifa feat. Charlie Puth – See You Again". Swiss Singles Chart. Retrieved April 12, 2015. ^ "Official Singles Chart Top 100". Official Charts Company. Retrieved June 11, 2015. ^ "Official R&B Singles Chart Top 40". Official Charts Company. Retrieved June 11, 2015. ^ "Wiz Khalifa Chart History (Hot 100)". Billboard. Retrieved April 15, 2015. ^ "Wiz Khalifa Chart History (Adult Contemporary)". Billboard. Retrieved July 14, 2015. ^ "Wiz Khalifa Chart History (Adult Pop Songs)". Billboard. Retrieved July 14, 2015. ^ "Wiz Khalifa Chart History (Dance Mix/Show Airplay)". Billboard. Retrieved May 28, 2015. ^ "Wiz Khalifa Chart History (Hot R&B/Hip-Hop Songs)". Billboard. Retrieved April 16, 2015. ^ "Wiz Khalifa Chart History (Pop Songs)". Billboard. Retrieved May 21, 2015. ^ "Wiz Khalifa Chart History (Rhythmic)". Billboard. Retrieved May 28, 2015. ^ "ARIA Top 100 Urban Singles 2015". ARIA. Retrieved December 12, 2016. ^ "Jahreshitparade 2015" (in German). Austrian Charts Portal. Hung Medien. Retrieved April 27, 2017. ^ "Jaaroverzichten 2015". Ultratop. Ultratop & Hung Medien. Retrieved April 27, 2017. ^ "Rapports Annuels 2015". Ultratop. Utratop & Hung Medien. Retrieved April 27, 2017. ^ "Tracklisten Top 2015". Hitlisten.nu. IFPI. Retrieved April 27, 2017. ^ "Top 100 Single-Jahrescharts". GfK Entertainment (in German). offiziellecharts.de. Retrieved January 6, 2016. ^ "Japan Hot 100 Year End 2015". Billboard. Prometheus Global Media. Retrieved December 9, 2015. ^ "SloTop50: Slovenian official year end singles chart". slotop50.si. Retrieved April 27, 2017. ^ "TOP 100 Canciones Anual 2015". promusicae.es. December 27, 2015. Retrieved April 27, 2017. ^ "Årslista Singlar – År 2015" (in Swedish). Sverigetopplistan. Swedish Recording Industry Association. Retrieved April 27, 2017. ^ "Schweizer Jahreshitparade 2015". Hitparade. Hung Medien. Retrieved April 27, 2017. ^ "Hot R&B/Hip Hop Songs: Year-End 2015". Billboard.com. Retrieved December 11, 2015. ^ "Canadian Hot 100 Year End 2016". Billboard. Retrieved December 8, 2016. ^ "Austrian single certifications – Wiz Khalifa – See You Again" (in German). IFPI Austria. Enter Wiz Khalifa in the field Interpret. Enter See You Again in the field Titel. Select single in the field Format. Click Suchen. ^ "Ultratop − Goud en Platina – singles 2015". Ultratop. Hung Medien. Retrieved October 2, 2015. ^ "2015 Nielsen Mid-Year Music Canada Report" (PDF). Nielsen. p. 4. Retrieved July 21, 2015. ^ "Canadian single certifications – Wiz Khalifa – See You Again". Music Canada. ^ "Certifications" (in Danish). International Federation of the Phonographic Industry. Retrieved May 12, 2015. ^ "Gold-/Platin-Datenbank (Wiz Khalifa feat. Charlie Puth; 'See You Again')" (in German). Bundesverband Musikindustrie. Retrieved April 14, 2018. ^ "Italian single certifications – Wiz Khalifa – See you Again" (in Italian). Federazione Industria Musicale Italiana. Retrieved December 27, 2018. Select "2017" in the "Anno" drop-down menu. Select "See you Again" in the "Filtra" field. Select "Singoli online" under "Sezione". ^ "New Zealand single certifications – Wiz Khalifa feat. Charlie Puth – See You Again". Recorded Music NZ. Retrieved September 4, 2015. ^ "Norwegian single certifications – Charlie Puth – See You Again" (in Norwegian). IFPI Norway. ^ "Wiz Khalifa – See You Again". Novedades y Listas Oficiales de Ventas de Música en España. ^ "Sverigetopplistan". Sverigetopplistan. April 16, 2015. Retrieved April 16, 2015. ^ "The Official Swiss Charts and Music Community: Awards (Wiz Khalifa feat. Charlie Puth; 'See You Again')". IFPI Switzerland. Hung Medien. Retrieved November 29, 2015. ^ Copsey, Rob (July 11, 2017). "Psy's Gangnam Style is no longer the most watched video on YouTube". Official Charts Company. Retrieved July 12, 2017. ^ "British single certifications – Wiz Khalifa feat. Charlie Puth – See You Again". British Phonographic Industry. Select singles in the Format field. Select Platinum in the Certification field. Type See You Again in the "Search BPI Awards" field and then press Enter. ^ "American single certifications – Wiz Khalifa feat. Charlie Puth – See You Again". Recording Industry Association of America. Retrieved November 21, 2018. If necessary, click Advanced, then click Format, then select Single, then click SEARCH. ^ Middleton, Ryan. "'Furious 7' Soundtrack: Wiz Khalifa and Charlie Puth Share 'See You Again'". Music Times. Retrieved April 4, 2015. ^ "Top 40/M Future Releases". All Access Music Group. Archived from the original on April 7, 2015. This page was last edited on 20 April 2019, at 23:46 (UTC).